This research companion has three complementary aims. First, to offer an overview of the current theoretical approaches to secession in the social sciences, international relations, legal theory, political theory and applied ethics. Second, to outline the current practice of international recognition of secession and current domestic and international laws which regulate secession. 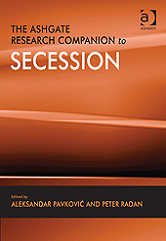 Third, to offer an account of major secessionist movements - past and present - from a comparative perspective.